Metal Detectors Security Systems is a great barrier against gun assault. It’s highly recommended for advanced security system to use metal Detector in government offices, institutions, airports, schools and any place people gather these days. 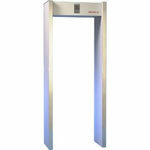 Offering unique and uniform detection field for optimal safety, the Autoclear Metal Detectors prevent any mishap from taking place. Our award winning multi-faceted Metal Detector security Portal is a perfect choice for high-security needed areas. The multiple paired antenna coils in the Metal Detector minimize the instances of false alarm and on the personal items and thereby, offering maximum reliability and detection. The added advantage of audio visual alarm and tricolor LED bar graph increases the reliability and functioning of this high-end machine. Autoclear Metal Detectors are dependable solution to everyday security problems that demand one-time investment in lieu of security assistance for years to come.